But equally worrying is the manner in which complaints launched against the election procedures have been dismissed by institutions responsible for the fairness of elections – the local, provincial and supreme election boards, have so far dismissed all of the CHP’s complaints in Ankara. The question raised by the seemingly skewed oversight is whether the upheaval in Turkey’s judiciary that Erdogan embarked on after the scandal broke – the reassignment or sacking of prosecutors and the threat to remove judges who are associated with moderate U.S.-based Islamist cleric Fethullah Gulen – has intimidated the election boards, whose voting members are all judges. In this atmosphere, where judges may not dare to act in any way against the government, a small source of optimism can still be found in the activism of citizenship initiatives, like that of Ankaran’in Oylari (hereby, AO) in Ankara. Today, thanks to the activities of AO’s may volunteers, we actually have data on some of the above stated irregularities. After the elections, volunteers from AO went thru images of the vote sheets associated with individual ballot boxes. Their efforts not only showed an absence of the official stamp on a quarter of these sheets but also extensive irregularities in recording invalid ballots. A related website contains images of all the ballots, many which have extensive issues. Below are two examples with inconsistencies, one with, and one without the official stamp. 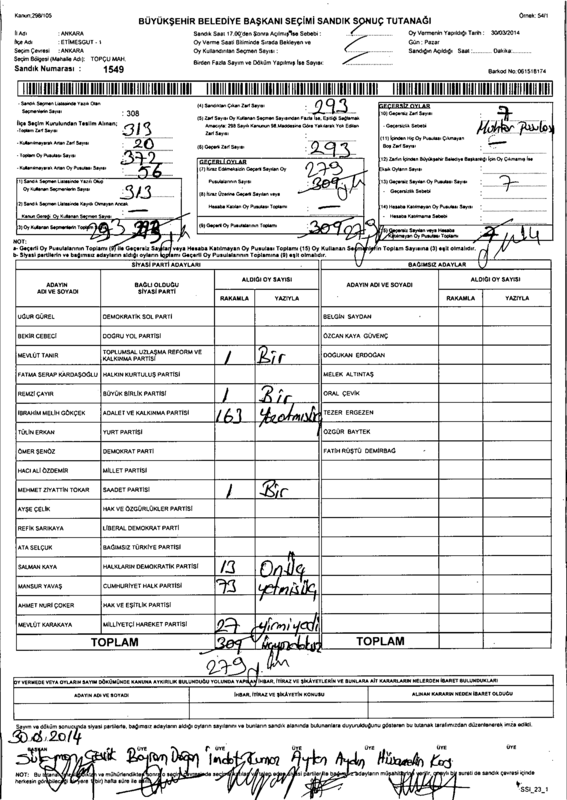 Neither of the vote sheets properly records the invalid ballots (in the upper right corner). AO (and especially Emre Koyuncu) was kind enough to share with me their data regarding both stamps as well as improper recording of invalid ballots. These are two variables, one a dichotomous variable indicating the absence of a stamped ballot box, and the second is another dichotomous variable indicating the presence of improper recording of invalid ballots. These have been matched with the ballot box voting data from the CHP-STS dataset (described in earlier posts here and here). At first, I plot the ballot box-level votes for AKP and the CHP below, with red (black) dots indicating an unstamped (stamped) ballot box in the left-hand side graph, and with improper (proper) recording of invalid ballots in the right-hand graph. The two graphs show ample occurrences of the different types of irregularities on both sides of the political spectrum, and the different types appear to be far from perfectly correlated. 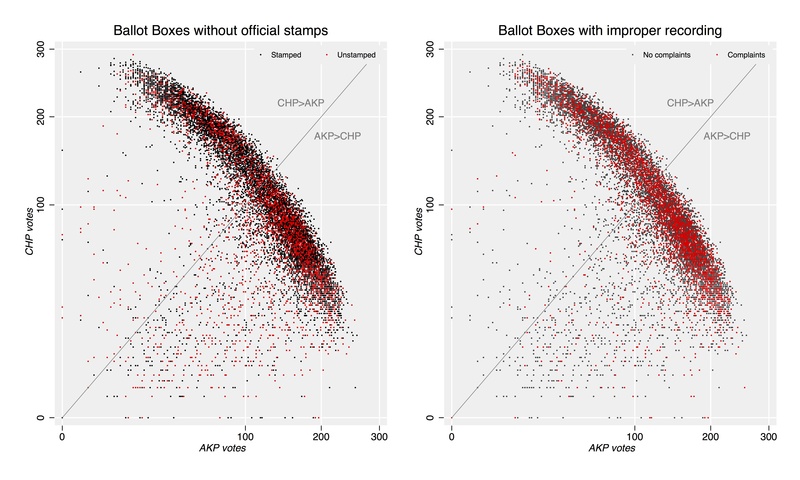 For example, unstamped ballot boxes (in the left graph) appear more common among the smaller-size boxes, likely the more rural and AKP-leaning parts of Ankara (which has been discussed on this blog before here, and documented by Murat Eren are also more likely to have abnormally high turnout). Cases of improper coding of invalid ballots (the right-hand graph) are to a larger degree concentrated among the more populous districts which predominantly tend to have capped-out ballot box sizes (300). Is there any indication that ballot boxes with more irregularities tend to shift the distribution of votes in a particular way? 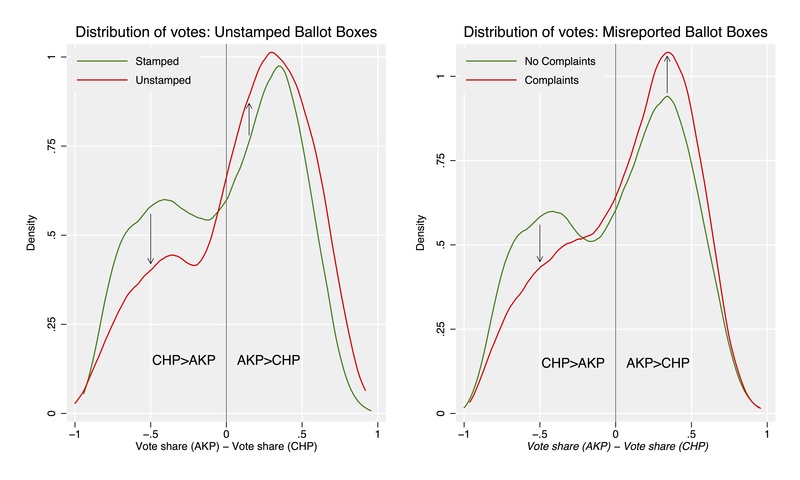 To shed som light on this I graph the distribution (kernel density) of the AKP-CHP vote margin (equivalently the AKP vote share minus the CHP vote share) for those ballots that 1) have stamps versus no stamps (left) and 2) have documented complaints over recording of invalid ballots or not (right). In both the left and right graphs, moving from regular to irregular ballot boxes appear to shift the distribution in favor of the AKP. Among the respective samples with documented irregularities, there are much fewer ballot boxes favoring the opposition party CHP and many more favoring the AKP. The occurrence of such large quantities of irregular ballot boxes should be of concern out of principle. But if irregularities were clustered in districts that were more likely to feature recording and procedural mistakes, like the poorer more rural districts who might vote for the AKP regardless, this may not necessarily have an impact on the election. However, as the two below graphs show, many of these inconsistencies occur in the larger and richer districts of Ankara, and those that tend to favor the opposition more. The concentration of irregularities in Çankaya – a bastion of the opposition – as well as some of the swing districts, is concerning. As before, this analysis cannot conclude that there has been systematic fraud. Yet as the irregularities keep piling up, it would appear a no-brainer that the election for metropolitan mayor in Ankara needs to be properly investigated for vote rigging. Some of these irregularities may have biased the results, an example being the systematic correlation between invalid share of ballots and the AKP bias I’ve documented here and here. It is rather surprising that the Turkish election board, YSK, has accepted the large number of voting irregularities in Ankara and rejected calls for investigation, when in other cities these have been awarded after complaints. What appears to be rather arbitrary rulings of recounts and re-runs could be inherently linked to some of the irregularities. Whereas some of these may have acted to bias votes towards one party or another, other irregularities may have provided the authorities with a safeguard, an excuse to declare elections invalid should the votes not fall in their favor. As such, the reason why Ankara’s (and probably many other) local elections need to be investigated for vote rigging, is not necessarily that mechanisms have systematically biased electoral returns toward the government, but that these allegations going unanswered will only further erode the democratic fabric and trust in the country’s institutions. Until the authorities take the responsibility for investigating these claims, citizenship initiatives like the AO in Ankara, Oye ve Ötesi in Istanbul, will continue to play a crucial role in verifying election results. If there is a silver lining here, it is the mushrooming of these initiatives, a sign that Turkey’s citizens are ready for democracy, even if their government isn’t. I’ve just heard from karayalçın that chp had representatives at only one third of the voting boxes in ankara. karayalçın was chp’s 2009 candidate and he lost to gökçek mainly because of mansur yavaş (mhp’s candidate at that time: gökçek got 38%, karayalçın 32%, mansur 28%), so he was critical of mansur’s candidacy at this election. this means we may be cautious about his claims. but still it’s apparent that akp representatives were dominant at some voting stations. once more, thanks for the analysis. 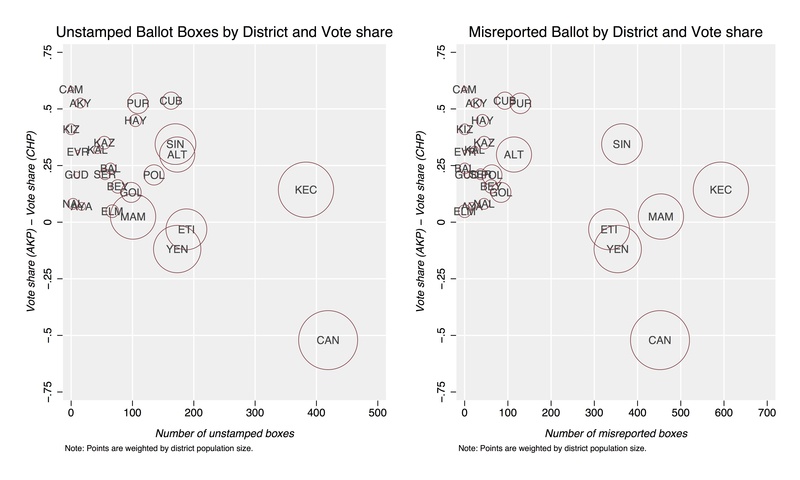 an analysis of the distribution of unstamped and mispreported boxes controlling for ilçe and voting location, just as you did on your post dated april 1, may give some more valuable info. I’ll check with emre koyuncu and I can try doing it if I can access the data. 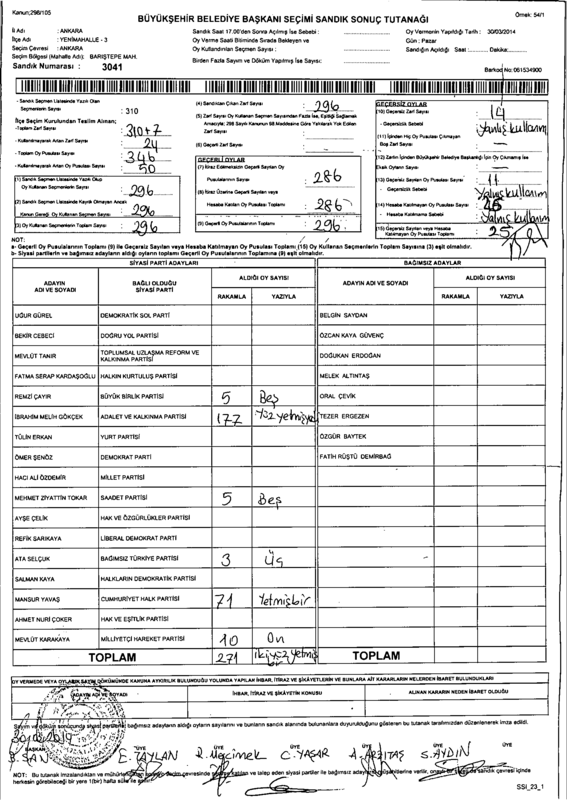 In the blog post below, I provide TWO EXAMPLES where the ballot box report carries the official seal of the ballot box committee, but the scanned image found at oyumucaldirtmam.com appears not to have it. In summary, the scanned images at oyumucaldirtmam.com are 1 BIT PNG files with about 60-70KB size so they are incapable of displaying the seals on the documents, especially if the seal is somewhat faint. Is this data available to public? I am giving a talk on data visualization and would love to work with this dataset. Pingback: Why has the world given up on Turkey? | What's up, Turkey?